Looks like y'all had a blast! Love a make it yourself pizza night!!! Robertson loves putting ours on the green egg-so good and smoky!!! How fun, looks like a blast. I might have to steal this idea!! Yummers! It looks like a weekend well spent! You look like such a fun bunch, love the way you are hamming it up for the camera and might I say the pizzas look darn good too! looks like a blast! & looks yummy too! I love potato leek pizza! Looks like y'all had a blast! Did Walker sleep through the pizza party? Thats the best Shannon!! Great fun! That looks like so much fun! Now I'm trying to come up with a reason to have a pizza party! We have Supper Club once a month with 10-12 friends and it is always fun! 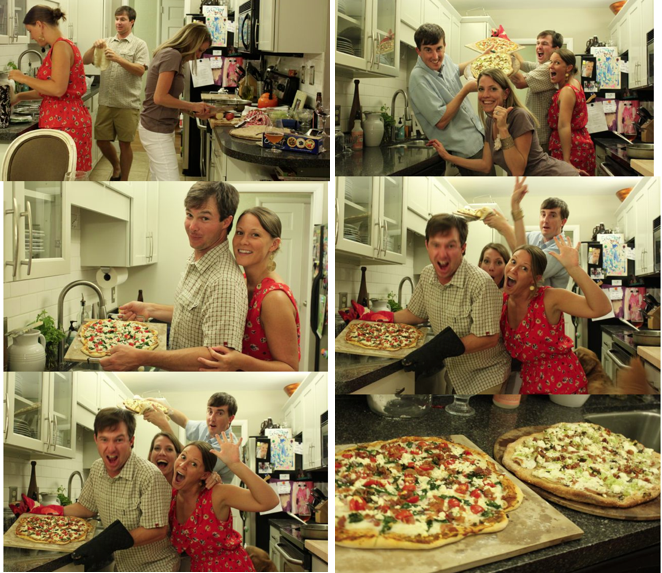 We did pizza night once, where each couple made one and it has been everyone's favorite since!